I just had to post this photo of the cowrie shell I found at the point near where we live in Los Organos, Peru. 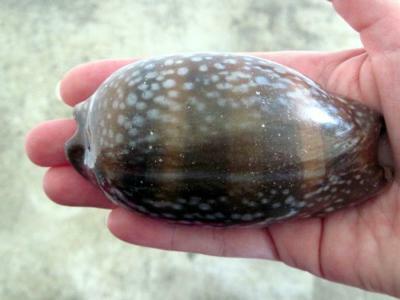 The locals say this size is very hard to find, although there are many small, like 1-1/2 inch, cowrie shells. Other shells are abundant, although it is not that easy to find intact shells, as the waves are pretty rough here. very beautiful shell. well done.